Pageants Before Christmas: The Winter Solstice Makes Time : 13.7: Cosmos And Culture Why do we celebrate Christmas just a few days after the winter solstice when almost no one thinks Jesus was born on December 25th? 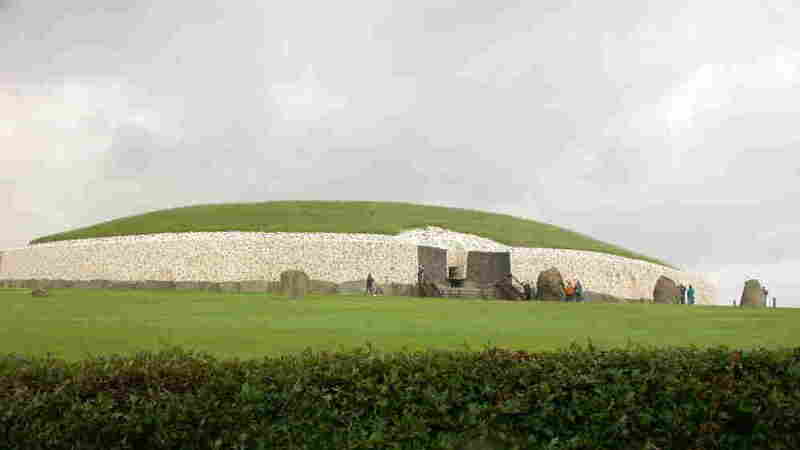 Newgrange: A monument to the winter solstice. Why do we celebrate Christmas just a few days after the winter solstice when almost no one thinks Jesus was born on December 25th? Is the astronomical connection with Christianity's high holy day a fluke or an ancient cynical political calculation. Or, more importantly, does it point us to a deeper truth now almost entirely lost in a world alienated from its own most intimate experience of the night sky? Before we answer that question we must stop for a word from our solar system. What, exactly is the winter solstice? The winter and summer solstices mark the poles of Earth's temporal cycle as it marches around the Sun. Our planet's spin axis is tilted 23 degrees relative to the line linking us with our Star (that line defines the plane of our orbit as we sweep around Sol). Since the spin axis direction remains fixed relative to the stars (i.e. it points for now towards Polaris, the "North Star"), the duration of daylight changes as the Earth moves around the Sun. In the northern hemisphere the Earth's axis is tilted towards the Sun in the summer and we have long days (more hours of sunlight). Likewise the axis is tilted away from the Sun in the northern hemisphere in the winter and we have short days. The winter solstice marks that day with the fewest sunlit hours (again, in the northern hemisphere). At winter solstice the sun marks its southern-most rising. Also on the solstice the Sun's noontime position is its lowest (closest to the horizon) of the entire year. Each of these extremes are connected (rising position, noontime position and hours of daylight) and all result from the basic fact that the axis of our planet's spin and the axis of its orbit around the Sun are not aligned. Which brings us back to, and before, Christmas. There remains a lot debate about the how Christmas got its location on the calendar. The popular account makes hay of the ancient Roman's pinning the solstice to December 25th. Early Christians simply co-opted the solstice for the own ends, or so the story goes. To make things more explicit, in 274 C.E., the Roman emperor Aurelian established a feast of the birth of Sol Invictus (the Unconquered Sun), on December 25. Given this Roman holiday and the fact that barbarian peoples of both western and northern Europe would have had their own festivals during this period, it seems reasonable that Christmas is really "a spin-off" from early pagan solar holy days. "Early Christian writers never hint at any recent calendrical engineering; they clearly don’t think the date was chosen by the church. Rather they see the coincidence as a providential sign, as natural proof that God had selected Jesus over the false pagan gods." Reading over the debate one finds a definite undercurrent of either antagonism or reactive defensiveness. Sometimes the "pagan-co-opt" camp seems intent on proving the political machinations of Christians in stealing the solstice holiday of others for their own ends. The "anti-co-opt" camp can seem just as intent on liberating the church's founders from claims of holiday pilfering. What is lost in all this argumentation, however, is the very real loss we have all suffered in the long march of centuries. Astronomy, you see, has always been destiny. We have simply been able to forget that fact for a century or so. Most of us we have little first hand experience of the solstice and its celestial message. Living in a world saturated with artificial illumination and run off meticulously accurate, mechanical (or electronic) chronometers, we rarely notice anything that happens in the sky. But the genes we carry in every cell of our bodies know. They remember. For those thousands of human generations -- those whose ancestry you inherited -- the Sun, the sky and the stars were the only true pageant and its turnings signaled life and death. The sky foretold the end of winter and hunger, it signaled the beginning of warmth and renewed growth. In this way our great, great, great grandparents could not help but see the heavenly wheels turn and they could not help but turn their imaginative creations, sacred or otherwise, to its imperatives. Seventy kilometers or so north of Dublin stands the Neolithic monument at Newgrange. The 80-meter wide circular mound was built 500 years before the pyramids and 3,000 years before anyone thought about when to hold Christmas. There is only one entrance, a narrow 25-meter long passageway that leads into a vaulted central chamber. Without a flashlight, it is darker than death itself within the chamber. But for a few days each year around the winter solstice the rising sun aligns with the ancient passageway and something remarkable happens. A shaft of sunlight pierces the darkness and, for a few minutes, the central chamber glows in warm ochre -- a promise of the light and life to come with the approaching spring. With the massive effort required to build Newgrange 5,000 years ago the forgotten builders of Newgrange show us that they knew something in their bones that we can barely recall. The sky has always been our first tabernacle, our first vault of the sacred. That we live in a scientific age does not change this fact. No one need feel offended, defensive or outraged that Christianity's holiest day falls near the turning of the year. It should not be a surprise. In fact, it should serve as a reminder. The solistice was always a holy day. We are born of the world and we are born of the stars. None of our changing perspectives, religious or scientific, can change that fact. We once knew it in our bones. Buried down deep we still know.